What type of fly fishing reels will you need? Assuming you already have a fly rod now you need to choose one of the many fly fishing reels available to compliment it. There are many brands to choose from like Abel and Albright to name a few. Fly fishing equipment must all work together as one balanced unit so there are a few things to consider. Once you determine which reel you want you are still going to need the following items fly rod fly line waders wading boots artificial flies fishing vests and other gear. You will also determine that you will need a good pair of polarized sunglasses and apparel before you hit the water. You can find these items at many fly shops and on line retailers. I have a relationship with Amazon and have created my own Fly Shop. I have selected some of their most popular items from the various equipment categories and put them in one place for your convenience. Try it out. Click on any of the links and it will take you to an even greater selection. Have fun. I like Amazon because they have great prices on name brand quality items along with shipping and secure transactions. Like fly rods, these come in all sizes and prices. They all will appear similar meaning that they all have a drag system, a spool and outer casing but the differences are usually the material, construction and capability, which all lead to the price. Your fly fishing equipment should be designed to work together as one unit. Each item needs to be designed to work with the other. Once you have determined what kind of fish you will typically fish for you will know what weight of a fly rod to use and what size fly line to use. Once that is put together you will know what type of reel to use. This is why for a beginner it is very important to get an expert to help you with your initial purchase or to purchase a combination kit (fly rod, reel and line) that is already set to work as one unit for the type of fish you seek. The one pictured below is available at Cabela's for $159.99 and would be perfect for a beginner. Other things to understand are fly line and backing. The backing serves 2 purposes, one is too fill up the reel with line, which will allow you to retrieve the line faster, and secondly it is to give you more line in case the fish runs on you. If you will be fishing in salt water make sure you get one with a body that has salt-water protection. This is extremely important if you will be fishing salt water, as it will keep your gear in good shape. Many fish are lost because of having a poor equipment. If you don’t have a good drag system, or if the line does not flow easily you will lose fish. You can spend any where between $40 and $500 for this fly fishing equipment. You should stay away from the low end if you want a good one that will last many years. You can get a nice piece of equipment that will last a long time from many different manufacturers for about $150. Now that you have all of this information it is time to pick one out. You can start with my link with Amazon, I have several to choose from and they offer even more, just click on any image once your on the site. Go to my Fly Shop. Cabela's Buyer's Guides is a complete on-line store that you can purchase any fishing supplies, apparel and things for the cabin. Click on the picture below to see Cabela's many options for this and other fly fishing gear. The Lamson Guru pictured retails for $199.99. Various Fly Shops and Bait Shops would be a great place to go to talk to someone face to face that is knowledgeable of your area and can make recommendations that would fit your budget. find a place to fish near you. 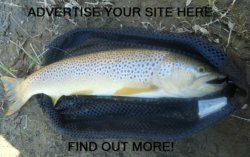 Leave the fly fishing reels page and return to the home page. View one of these related sites. Click below for stream flow data This is nationwide data, select your state, click real time data, then choose location. Having stable water conditions makes for better fishing.